Aim: This study includes a comparative evaluation of the various surface treatments of the intaglio surface of crowns in combination with various luting agents for maximal retention. Materials and Methods: Totally, 150 dies of a standard complete crown preparation were fabricated. Wax pattern with a loop on the occlusal surface was prepared on each die using standard procedures, and then crowns were cast with nickel-chromium alloy. These crowns were randomly divided into five groups as per the surface of the intaglio surface of the metal copings. The crowns in each group were again subdivided randomly into three groups as per the luting agents used resin-modified glass ionomer cement, glass ionomer cement, and zinc phosphate cement. 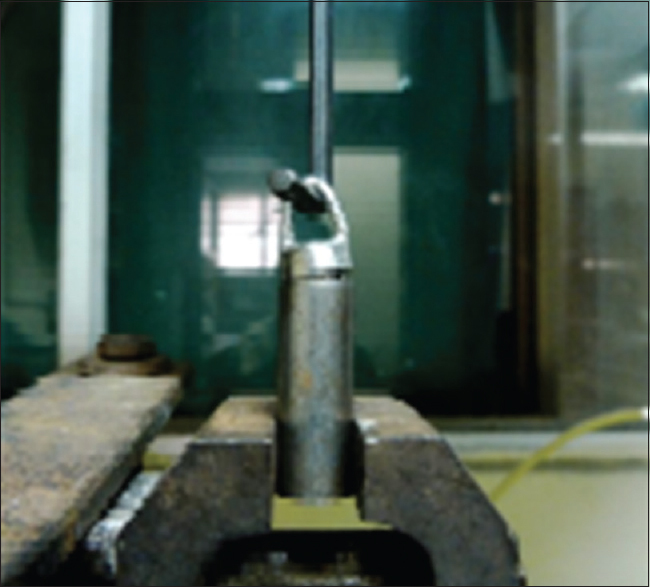 Retention was measured (MPa) by separating the metal crowns from the metallic die under tension on a Universal testing machine. Statistical Analysis Used: The data were recorded and statistically analyzed using one-way analysis of variance followed by Tukey's test. Results: The retention differed both with surface treatment and type of luting agents. Untreated group showed the least bond strengths < sandblasting with 50 µm alumina < sandblasting with 50 µm alumina with ultrasonic cleaning < sandblasting with 110 µm alumina < sandblasting with 110 µm alumina along with ultrasonic cleaning. For luting agents, glass ionomer cement showed least bond strength because there was no chemical bonding present between metal crown and metallic die, followed by zinc phosphate cement and maximum bond strength were found for resin-modified glass ionomer cement. Conclusion: Among all types of surface treatments used in this study, maximum bond strength was yielded by sandblasting with 110 µm alumina + ultrasonic cleaning and the best luting agent was resin-modified glass ionomer cement. The principles of tooth preparation may be divided into three broad categories viz., the biologic considerations which affect the health of the oral tissues, mechanical considerations which affect the integrity and durability of the restoration and esthetic considerations which affect the appearance of the patient. Successful tooth preparation and subsequent restoration depend on simultaneous consideration of all these factors. The resistance to displacement of a cast restoration during function depends largely on the provision of adequate mechanical form in the preparation. These mechanical forms must adhere to certain principles, else the restoration may become dislodged or may distort or fracture during service. Certain mechanical provisions in the preparation that prevent these problems include, providing retention form, providing resistance form, and preventing deformation of the restoration. Retention form of a crown can be defined as a feature of a tooth preparation that resists dislodgment of a crown in a vertical direction or along the path of placement. Various factors affecting retention include magnitude of the dislodging forces, geometry of the tooth preparation, roughness of the fitting surface of the restoration, materials used for cementation, and film thickness of the luting agent. Of all the above-mentioned factors, roughness of the fitting surface of the restoration and choice of luting agents have received least attention by investigators so far. 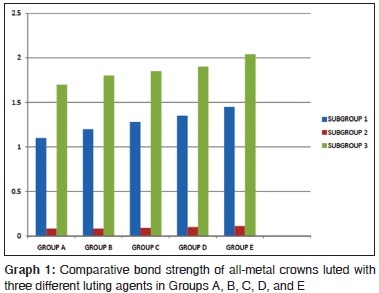 Considering the same, this study is aimed to evaluate the effectiveness of different methods of surface treatment of the crown and also efficacy of different luting agents to prevent bond failure. The bond strength of full metal crowns with the metallic die was compared with variance in regard to different methods of treating the intaglio surface of the crowns and different luting agents. To compare all the samples with the untreated control group. The study was based on the null hypothesis that different luting agents and various modes of surface treatments of the intaglio surface has no quantitative effect on in-vitro tensile strength of all-metal crowns. The occlusal surface of the preparation was kept flat. 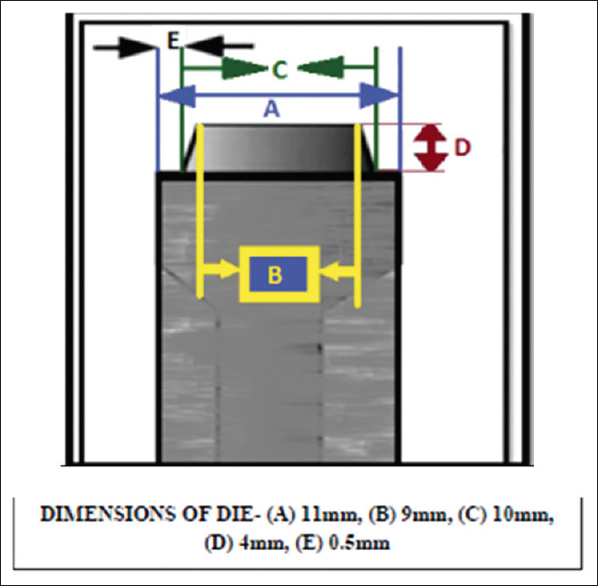 A uniform thickness (20 μ) of gray die spacer (Colour Spacer, Han Dae Chemical Co., Ltd., Korea) was applied on each model [Figure 2] with the help of an applicator brush in a single layer. Blue inlay wax (Crown wax, Bego, Germany) was used to fabricate the wax pattern of the restoration. A wax loop of 2.0 mm diameter (Casting Wax Wire, Dental Materials Factory, Shanghai Medical Instruments Co., Ltd.) was attached to the occlusal surface of the wax pattern [Figure 2] to facilitate testing of the tensile bond strength. All wax patterns were sprued, immediately invested using Type V gypsum product (Vestofix, DFS, Diamon, Germany), and casted with nickel-chromium alloy (Bellabond Plus, Bego, Germany). Castings were bench cooled to room temperature and allowed to recover from investment. After necessary adjustment and finishing, casting fit onto the metallic die was assessed. After ensuring their passive fit, the cast crowns and corresponding metallic dies were assigned to five groups of 30 each, according to the surface treatment of the intaglio surface of crowns. After all the samples were surface treated, samples in each group were further divided into three subgroups. Each subgroup consisted of 10 samples and they were luted with three different luting agents-GIC (Vivaglass, Ivoclar Vivadent), Resin-modified GIC (Multilink N, Ivoclar Vivadent), and Zinc phosphate cement (Elite Cement100, GC Corporation, Tokyo, Japan). The samples were then divided into five different groups according to various modes of surface treatments. Of these five groups, one was left untreated which served as the control group. The crowns were then luted with three different luting agents, as described earlier, going through various modes of surface treatments [Figure 2]. 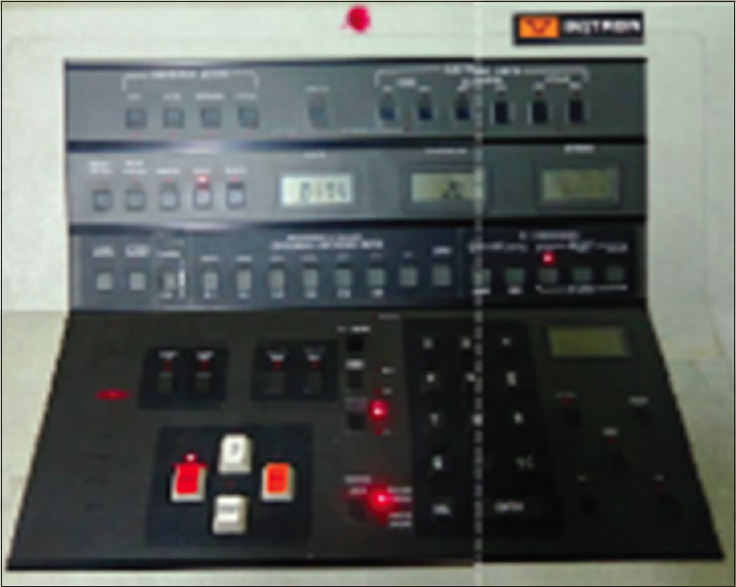 Each cemented specimen was mounted on Instron Universal testing machine (model no. 4202, Buckinghamshire, England) [Figure 3] for testing load of dislodgement. This device ensured that the removal force was aligned along the axis of the preparation [Figure 4]. 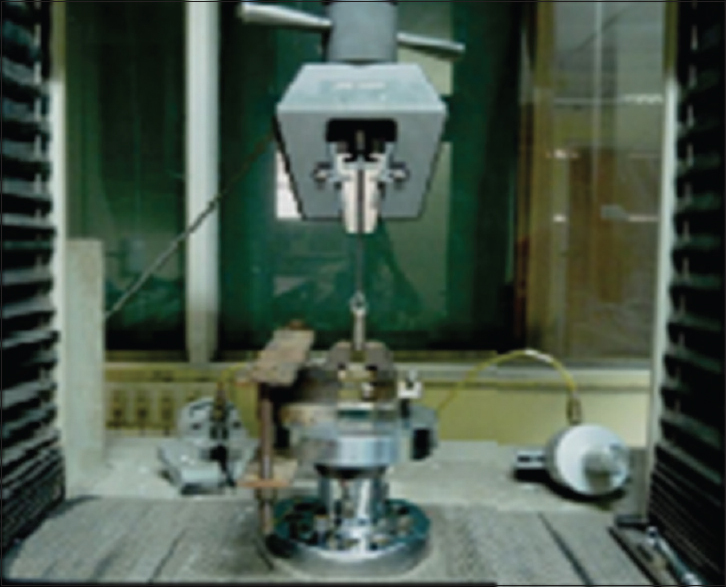 A tensile load was applied using a 1000-N load cell and a 0.5 mm/min crosshead speed until separation occurred. The load of dislodgement of crowns was recorded in unit of force (kN) [Figure 5]. The divisions of groups were based on the type of surface treatment of the intaglio surface of crown [Figure 6]. Groups A-E were further divided into three subgroups according to the type of the luting agent used for cementation. Subgroup 3: Luted with resin-modified glass ionomer cement. The data obtained were subjected to statistical analysis using one-way analysis of variance followed by Tukey's test. The effectivity of various modes of surface treatment and luting agents on retention was also one of the objectives to be evaluated from the data obtained. The mean average values were calculated for each group and the standard deviations were computed. The statistical analysis was performed with the help of critical difference or least significant difference at 5% and 1% level of significance to compare the mean values. P < 0.05 was taken to be statistically significant. F – Value of test (variance of the group means/mean of the within group variances). The results and statistical analysis of all the five groups (A, B, C, D, and E) are tabulated in [Table 1] and graphical representation of the same is shown in [Graph 1]. Numerous factors can affect the long-term success of dental cast restorations. Selection of luting cement and surface roughness of intaglio surface of fixed prosthesis are essential factors in achieving suitable retention for complete cast crowns. This study is an attempt to substantiate the differences in retention that were attributable to choice of different modes of surface treatment and luting cement. From the statistical analysis of the data, it can be summarized that various types of surface treatments and luting agents have a definite influence on the retention of fixed prostheses. This can be explained by the load of dislodgement values, which were found to be least for the untreated group and higher for all groups undergoing any form of surface treatment. This is in accordance with the previous study done by O'Connor et al. in 1990 who concluded that retention of cast crowns can be improved by microblasting the internal surface. These findings also conform to further studies done by Al-Zain in 2006 who found that a combination of airborne-particle abrasion/ultrasonic cleaning, hand cleaning/steam cleaning, and hand cleaning/ultrasonic cleaning produced significantly higher crown retention values than that of hand cleaning alone. The results of the current study also showed significant differences in retention due to different luting agents used. The dislodgement values were found to be least for glass ionomer cement and highest for resin-modified glass ionomer cement. The decreased retention for glass ionomer cement was probably due to the predominant mechanical bonding between the metal crown and the metallic die and the absence of any chemical bonding in this scenario. Group A specimens (control) were subdivided into three sub groups depending on the type of luting agent (Group A1, A2, and A3) used. There was a significant difference in bond strength between Group A1, A2, and A3. The mean bond strength value was least for glass ionomer cement (0.08 ± 0.001 MPa) followed by zinc phosphate cement (1.10 ± 0.02 MPa) and maximum for resin-modified glass ionomer cement (1.70 ± 0.002 MPa). The lower values of bond strength for glass ionomer cements can be attributed to the fact that most clinical crowns are a combination of a core material and some tooth structure. In such a combination, the glass ionomer cement may produce bond strengths quite different from those obtained with a core material alone. The mechanism of bonding of glass ionomer cement involves chelation of carboxyl groups of the polyacids with the calcium in the apatite of enamel and dentin, but as in this study, metal crowns were luted to metallic dies, hence, such chemical interaction could not occur. Furthermore, a higher retention of zinc phosphate cement was reported on metallic surfaces which were probably due to the formation of chemical reaction substances resulting from a corrosive action of phosphoric acid bridging the cement-steel interface or portion of it. According to him, zinc phosphate has a good capability for wetting the surface due to its properties of lower surface tension, low viscosity, and good fluidity. In Group B, specimens were sandblasted with 50 μm alumina and sub-grouped as (Group B1, B2, and B3) based on the luting agent used. The mean bond strength values obtained were as follows: Glass ionomer cement (0.08 ± 0.0009 MPa) < zinc phosphate cement (1.20 ± 0.01 MPa) < resin-modified glass ionomer cement (1.79 ± 0.02 MPa). The results obtained for glass ionomer and zinc phosphate cements are in accordance with the previous studies conducted by Dilts et al. in 1986 and Glantz et al. in the year 1981 respectively., Compared to the control group, mean bond strength value did not change much for glass ionomer cement, but there was a significant increase in bond strength both for zinc phosphate and resin-modified glass ionomer cement. Blixt et al. in 2000 stated that sandblasting produces an enlarged surface for luting of chemically activated groups, increased wettability, and/or differences in surface structure, which may lead to the high bond strength of various luting agents. The specimens in Group C underwent ultrasonic cleaning along with sandblasting using 50 μm alumina, which were further divided into three subgroups and luted with three different cements (Group C1, C2, and C3). A combination of these two surface treatments was used in accordance with Quaas et al. in 2005, who stated that the embedded alumina particles were found in base metal alloys after sandblasting and the alumina content increased to a range of 14–37 wt% as measured by electronic data systems. Ultrasonic cleaning removed loose alumina or silica particles from the surface, resulting in an only slight decrease in alumina or silica contents, thus suggesting firm attachment of the major part of alumina and silica to the alloy surface. They also concluded that clinically ultrasonic cleaning of sandblasted samples improved resin bonding as loose surface particles are removed without relevant changes in composition. In subgroup C1, C2, and C3, the results obtained were statistically significant. The mean bond strengths obtained were as follows: Glass ionomer cement (0.09 ± 0.001 MPa) < zinc phosphate cement (1.27 ± 0.02 MPa) < resin-modified glass ionomer cement (1.85 ± 0.01 MPa). In comparison to the control group, there was a significant increase in bond strength for all the three subgroups. In Group D, the intaglio surface of the metal crowns was treated with sandblasting using 110 μm alumina particles and sub-grouped as D1, D2, and D3. A significant difference in bond strength values of the metal crowns obtained was as follows glass ionomer cement (0.10 ± 0.002 MPa) < zinc phosphate cement (1.34 ± 0.01 MPa) < resin-modified glass ionomer cement (1.89 ± 0.005 MPa. Blixt et al. in 2000, found a significant increase in bond strength for all three subgroups in comparison to the control group. According to Kern and Thompson in 1994, the sandblasting procedures with silica particles containing aluminum oxide before application of a resin, may create a larger active surface by forming a silica layer. The silane coupling agent present in the resin-modified glass ionomer cement enhances the bond between silica and the organic groups of the applied luting resin. Since the created silica layer is shown to be well attached to the intaglio surface of crown, this may partly explain the high values of adhesion related to resin-modified glass ionomer cement in the study. It was also seen that increasing the grit size of alumina particles from 50 to 110 μm increased retention of the crowns. This may be probably due to the phenomenon stated by Al Jabbari et al. in 2012 according to whom, increasing the grit size of alumina particles from 50 to 250 μm significantly increased the roughness of surface by up to 6.5% and thereby creating a larger activated layer for the action of luting agents. A significant difference in bond strength of the metal crowns was observed upon comparative evaluation of Groups E1, E2, and E3. Compared to the control group, there was a significant increase in bond strength for all three subgroups. Values obtained were as follows: Glass ionomer cement (0.11 ± 0.003 MPa) < zinc phosphate cement (1.45 ± 0.02 MPa) < resin-modified glass ionomer cement (2.03 ± 0.01 MPa).,, The sandblasting procedure with 110 μm alumina followed by ultrasonic cleaning apparently increased bond strength between crown and die. According to him, loose silica particles formed after sandblasting on the silica-coated surface could weaken the interface, whereas removal with ultrasonic cleaning could increase bond strengths. It was found that airborne-particle abrasion of the internal surface of Type III gold crowns with 50 μm aluminum oxide improved the retention of the cast restoration cemented with zinc phosphate cement. This is because debris and chemical contaminants are removed and at the same time minute roughness needed for mechanical interlocking is provided with the greatest resistance to shear stress. It was also stated by Kern and Thompson in 1994 that airborne particle abrasion with aluminum oxide alone resulted in an increased concentration of alumina on the metal surface, as documented by X-ray electronic design automation and microanalysis. On the other hand, Cobb et al. in 2000 concluded in their study that ultrasonic cleaning resulted in only a slight decrease in alumina contents of the metal by removing only loose alumina particles from its surface. Thus, the major part of alumina is firmly attached to the alloy surface. When a combination of airborne-particle abrasion and ultrasonic cleaning was used, the advantages of both cleaning methods were obtained which resulted in the highest crown retention that was significantly higher than that of any single cleaning method as seen in an in-vitro study. In the present study, upon comparing subgroups A1, B1, C1, D1, and E1 (crowns luted with zinc phosphate cement) it was found that there existed a significant difference in bond strength of the metal crowns after all the surface treatments. A gradual increase in values was observed: 50 μm alumina (1.20 ± 0.01 MPa) <50 μm alumina with ultrasonic cleaning (1.27 ± 0.02 MPa) <110 μm alumina (1.34 ± 0.01 MPa) <110 μm alumina with ultrasonic cleaning (1.45 ± 0.02 MPa) in comparison with the untreated group (1.10 ± 0.02 MPa) and with respect to each other. This study supported the findings of some earlier authors.,, A possible explanation for the influence of increased roughness on the retention of zinc phosphate could be that more cement floated into and hardened in undercuts where it required compression or shear fracture before the cement failed. Smooth surface had lower retentive values, but crowns undergoing only one type of surface treatment gave moderate retention values. Sandblasting (110 μm alumina) + ultrasonic cleaning – (0.19 ± 0.003 MPa). Finger in 1983 stated that glass ionomer cement attains retentive strength both through mechanical interlocking (crown cement interface) and physiochemical bonding (tooth-cement interface), but this study could not verify the claims of the superiority of glass ionomer compared with zinc phosphate cement with respect to retentive strength. There is a dearth of documentation in relation to the effect of surface treatment on retention when a metallic die is bonded to a metal crown with glass ionomer cement. The adhesion properties of the glass ionomer cement did not improve the retention of the castings in this study probably due to the fact that sandblasting produced an enlarged surface for the action of luting agents. According to Dilts et al. in 1986, glass ionomer cement produces higher bond strengths in a combination of a core material and a tooth as compared to core material alone, since glass ionomer cements did not show any chemical bonding between the die and the crown. While comparing subgroups A3, B3, C3, D3, and E3 (crowns luted with resin-modified glass ionomer cement) a significant difference in bond strength values was observed among all the surface treatment procedures. The value was significantly lower for untreated group. This observation is in accordance with the studies conducted by various authors in the past.,, The superiority of the retentive bond strength of resin-modified glass ionomer cement may be attributed to the capability of the cement to wet the involved surfaces. Vallittu and Forss in 1997 stated that the better adhesion properties of the resin-modified cement are responsible for improving the retention of the complete cast crowns. This should be attributed to the ability of 2-HEMA to quickly balance the network flexibility after curing of methacrylate groups bonded to polycarboxylate chains. Thus, the rapidly formed polymer network between 2-HEMA and the methacrylate groups of ionized and unionized fractions of polyacrylic acid decreased the rate of the acid-base reaction and apparently it is due to steric hindrance phenomena as stated by Eliades and Palaghias in 1993. To summarize the present study, the retention differed both with surface treatment and type of luting agents. Untreated group showed the least bond strengths < sandblasting with 50 μm alumina < sandblasting with 50 μm alumina with ultrasonic cleaning < sandblasting with 110 μm alumina < sandblasting with 110 μm alumina along with ultrasonic cleaning. For luting agents, glass ionomer cement showed least bond strength because there was no chemical bonding present between metal crown and metallic die, followed by zinc phosphate cement and maximum bond strength was found for resin-modified glass ionomer cement. In the comparative evaluation of the bond strength of the metal crowns luted with resin-modified glass ionomer cement in different groups of surface treatments, it was seen that maximum bond strength was seen in case of sandblasting with 110 μm alumina + ultrasonic cleaning. There was no simulation of the oral environment. We are thankful to The Department of Bioscience and Engineering, Jadavpur University, Kolkata, West Bengal, India for allowing us to test our samples using Universal Testing Machine. Rosenstiel SF, Land MF, Fujimoto J. Contemporary Fixed Prosthodontics. 4th ed. St. Louis, MO: Mosby-Year Book; 2001. p. 209-57, 258-71, 909-27. Potts RG, Shillingburg HT Jr, Duncanson MG Jr. Retention and resistance of preparations for cast restorations. J Prosthet Dent 1980;43:303-8. Lindquist E, Karlsson S. Success rate and failures for fixed partial dentures after 20 years of service: Part I. Int J Prosthodont 1998;11:133-8. Cameron SM, Morris WJ, Keesee SM, Barsky TB, Parker MH. The effect of preparation taper on the retention of cemented cast crowns under lateral fatigue loading. J Prosthet Dent 2006;95:456-61. Esbach O. Handbook of Engineering Fundamentals. 5th ed. New York: John Wiley and Sons, Inc.; 1995. O'Connor RP, Nayyar A, Kovarik RE. Effect of internal microblasting on retention of cemented cast crowns. J Prosthet Dent 1990;64:557-62. Al-Zain SA. 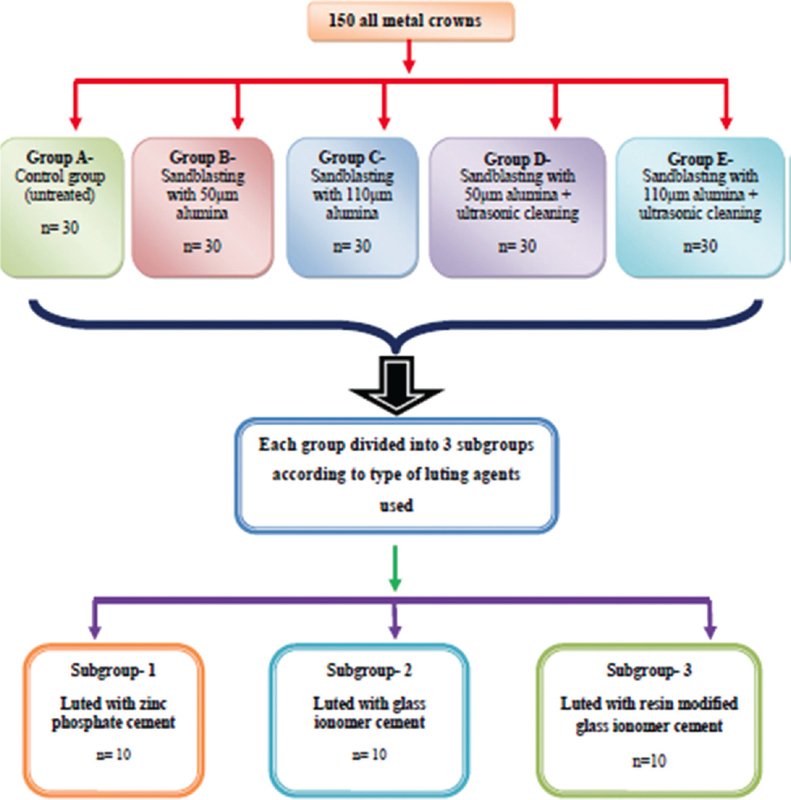 The effect of different metal cleaning methods on retention of cast crowns. Egypt Dent J 2006;52:2087-92. Dilts WE, Miller RC, Miranda FJ, Duncanson MG Jr. Effect of zinc oxide-eugenol on shear bond strengths of selected core/cement combinations. J Prosthet Dent 1986;55:206-8. Glantz PO, Jendresen MD, Wittbjer JE. Retention of zinc phosphate cement as influenced by post material. CDA J 1981;9:36-41. Blixt M, Adamczak E, Lindén LA, Odén A, Arvidson K. Bonding to densely sintered alumina surfaces: Effect of sandblasting and silica coating on shear bond strength of luting cements. Int J Prosthodont 2000;13:221-6. Quaas AC, Heide S, Freitag S, Kern M. Influence of metal cleaning methods on the resin bond strength to NiCr alloy. Dent Mater 2005;21:192-200. Kern M, Thompson VP. Sandblasting and silica-coating of dental alloys: Volume loss, morphology and changes in the surface composition. J Prosthet Dent 1994;71:453-61. Al Jabbari YS, Zinelis S, Eliades G. Effect of sandblasting conditions on alumina retention in representative dental alloys. Dent Mater J 2012;31:249-55. Hantsche H. Comparison of basic principles of the surface-specific analytical methods: AES/SAM, ESCA (XPS), SIMS and ISS with x-ray microanalysis and some applications in research and industry. Scanning 1989;11:257-80. Cobb DS, Vargas MA, Fridrich TA, Bouschlicher MR. Metal surface treatment: Characterization and effect on composite-to-metal bond strength. Oper Dent 2000;25:427-33. Oilo G, Jørgensen KD. The influence of surface roughness on the retentive ability of two dental luting cements. J Oral Rehabil 1978;5:377-89. Witwer DJ, Storey RJ, von Fraunhofer JA. The effects of surface texture and grooving on the retention of cast crowns. J Prosthet Dent 1986;56:421-4. Finger W. Evaluation of glass ionomer luting cements. Scand J Dent Res 1983;91:143-9. Zidan O, Ferguson GC. The retention of complete crowns prepared with three different tapers and luted with four different cements. J Prosthet Dent 2003;89:565-71. Vallittu PK, Forss H. Adhesion of glass ionomer cement to a ceramometal alloy. J Prosthet Dent 1997;77:12-6. Eliades G, Palaghias G.In vitro characterization of visible light-cured glass ionomer liners. Dent Mater 1993;9:198-203.